. . schuyler tsuda . .
SchuylerTsuda is an experimental composer and artist whose work involves instrumental research, instrument design/modification, and hardware and software electronics. His compositional mentor has been James Dillon, with whom he studied as a Ph.D. student until receiving his degree in 2010. Having been involved with the spectral music world for years, Schuyler has also worked with Iancu Dumitrescu, Ana-Maria Avram and Kaija Saariaho. He studied Csound under the instruction of James Hearon and Max/MSP under Nathan Wolek and Doug Geers. Schuyler Tsuda has had premiere performances by Irvine Arditti, Andrei Kivu, the East Coast Contemporary Ensemble (ECCE), Strains New Music Ensemble and the Contemporary Music Workshop (CMW) and has had his music performed at Darmstadt, the Spectrum XXI Festival, the Etchings Festival, the Santa Fe Chamber Music Festival and the Spark Festival. He has been nominated for the 2011 Julius F. Ježek Prize for Composition and the 2012 World New Music Days Festival. In 2009, Schuyler Tsuda received a McKnight Composer Fellowship, a Doctoral Dissertation Fellowship from the University of Minnesota, and a Hella Mears Graduate Fellowship in European Studies for research in Romania on spectral music. In 2014, he received a Barlow Endowment Commission for a new composition for ECCE. In 2017, he was awarded a residency through the Minneapolis-based 113 Composers Collective, and with their collaboration was given a solo composition concert, performed in his noise duo Shield Your Eyes and presented an audio circuit design workshop. He has most recently been invited to SXSW 2018 to present a workshop on audio circuit design. Schuyler Tsuda has also been an audio engineer since 2008 and co-founded the audio engineering/video production business, the Sonic Alchemists, LLC with Michael Duffy while living in Minneapolis. He has worked with classical and free jazz musicians, noise and experimental artists, indie rockers, and electro pop bands. He was the A1 engineer for the Doris Duke Theatre at the Honolulu Museum of Art, where he was Music Programmer and A/V Manager and has worked with artists such as Colin Stetson, the John Jorgenson Quinetet and House of Wolves. He currently does live sound for SculptureCenter in New York. Schuyler Tsuda has been a champion of new music, promoting the works of new composers and sound artists through his audio hacking Benders and Hackers Group, as vice president of the multi-disciplinary arts organization Arts Quarter Collective, and as co-founder and organizer of the DIY Minneapolis performance space Room Zero. He has produced music festivals and concert series like the Spark Festival of Electronic Music and Art, the interdisciplinary Artsmosis Festival and the indie/underground band series, the Secret Sound Showcase. In 2016, he produced, curated and performed in a 3-part instrument builder series for his residency at ShapeShifter Lab in NYC. As a filmmaker, Schuyler Tsuda won a Gold Remi Award at the WorldFest-Houston International Film Festival in 2007 and had screenings at the Bearded Child Film Festival in 2007 and 2008. He has taught film and video at the University of Minnesota and at Bramson ORT College in Queens. 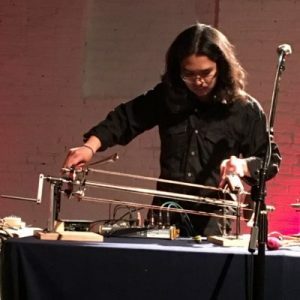 Schuyler Tsuda is also an experimental musician who builds sound sculptures, designs analog audio circuits and has performed in the Minneapolis-based noise duo Shield Your Eyes. He has had solo performances in Berlin, at the Sonic Arts Research Center (SARC) in Belfast and at Spectrum NYC. He has recorded with the Vultures Quartet and has had releases on Zoharum Records, Zos Kia Sound Recordings, Culture Asylum Magazine, and Classwar Karaoke. His improvisational work involves unusual acoustic phenomena, unorthodox instrumental technique, and obsessive, ritualistic sound manipulation. Every performance is unique, with instruments, software and/or installations custom-made for the performance. Schuyler Tsuda currently works at the Met, the Lincoln Center, SculptureCenter and Anthology Film Archives.